* Ninety percent (90%) of small enterprises backup their data daily or less frequently. Forty two percent (42%) of large enterprises answered that they back up data every few hours or shorter. * More than two-thirds of large enterprises (69%) need to recover data on a weekly or daily basis. Almost half of small companies (49%) reported they must recover data only quarterly or rarely. * Application failure was cited by 85% of large companies, making it the number one cause of data loss. For small companies, the causes for data loss were more localized. Power loss was the single largest cause, cited by 48% of small enterprises. How a company protects their data and what tools they select to manage the process is very dependent on their overall size. 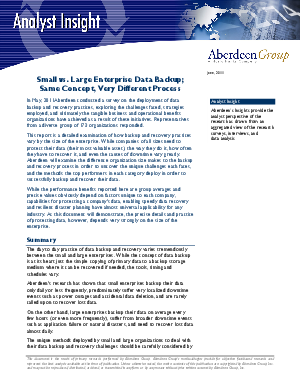 Organizations would be wise to examine the tools and technologies companies of their size are using for their data backup and recovery program.